This is the same course as the EFAW but with the addition of Tourniquet and Haemostatic dressing, use included. The ProTrainings Emergency First Aid at Work Level 3 qualification (EFAW) is ideal for most businesses whose risk assessment has identified that there is no requirement for a fully trained first aider for their workplace. 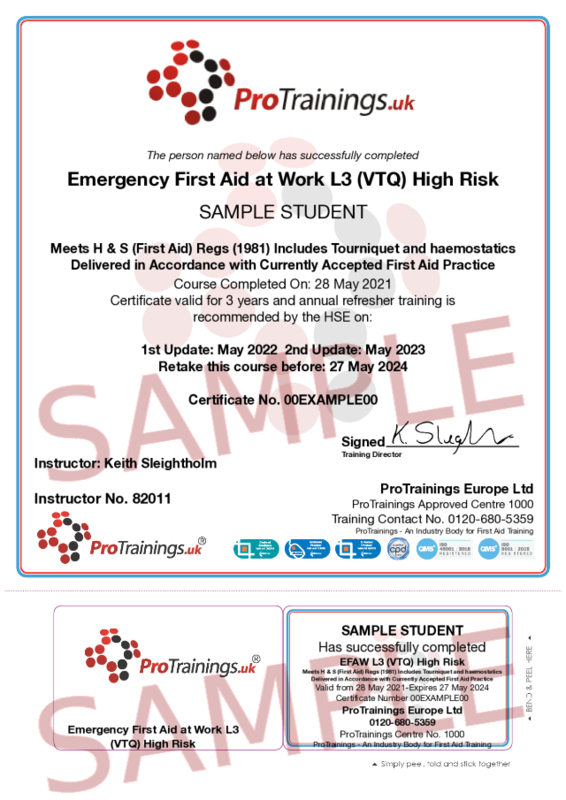 All courses are delivered, evaluated and quality assured to meet the new guidelines set out by the HSE in October 2017 and meet the requirements of the First Aid at Work (First Aid) regulations 1981 and subsequent 2016 changes. This blended EFAW course meets all of the requirements under the HSE and Awarding Organisations and is available as a ProTrainings or Regulated Qualification. To renew you need to attend another EFAW 6 hour course. This course must be delivered as a 100% classroom course and cannot be delivered via online or blended training to comply with the HSE requirements. Candidates completing our EFAW courses receive access to our video library for refreshing skills and reference. This course comes with 7.0 hours of CPD, although the time to complete the course online may be less than this.